My 2019 convention season started with the North Texas Comic Book Show on February 2-3 in Irving, Texas. The show was geared toward fans of the comic books of the 1970s and 1980s with terrific guests like Neal Adams, J.M. DeMatteis, Mike Zeck, Bob McLeod, Joe Staton, Larry Hama, Elliot S! Maggin, Keith Pollard, Al Milgrom, Randy Emberlin, Graham Nolan, Denys Cowan, Aaron Lopresti, John Beatty, Rudy Nebres, Larry Stroman, Scott Koblish, Michael Golden, Arthur Suydam, Tim Vigil, Bill Reinhold, Linda Lessmann Reinhold and my new friend Amy Chu. Thanks to Amy, convention goers will once more be seeing my cheesy Godzilla sketches. We’re not talking fine art here, but the sketches are somewhat amusing. I had a wonderful time at the North Texas Comic Book Show and will be writing about it in my personal blog in the near future. In the meantime, let me share that it is a wonderful and wonderfully run event. If invited to be a guest at the show in the future, say yes. If you’re a fan, start digging through your long boxes of classic comics to get them signed by some of the finest writers and artists in comics history. 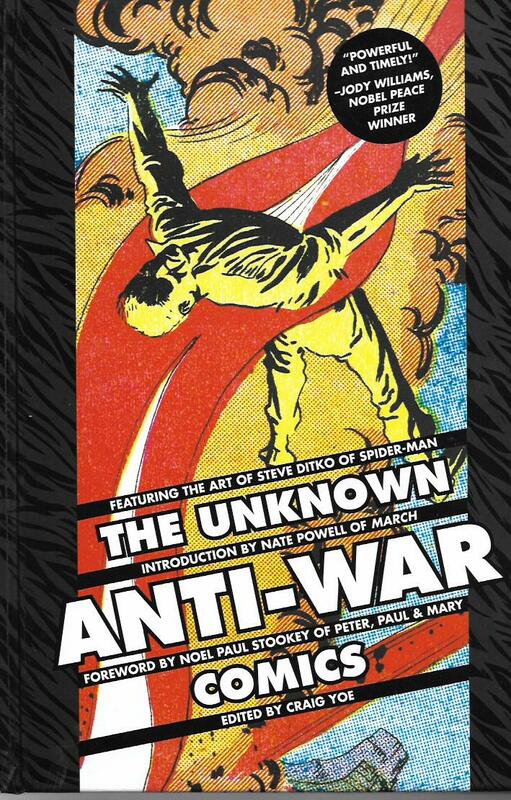 The Unknown Anti-War Comics [Yoe Books/IDW; $29.99] is this week’s pick of the week. Edited by Craig Yoe and featuring comics written and drawn by Steve Ditko, Joe Gill, Denny O’Neil and several rarely discussed comics creator, it’s a most unexpected book. It collects stories that appeared in various Charlton Comics genre titles – war and science fiction – that could honestly be described as anti-war stories. All but one of them originally appeared in comic books published during the Cold War of the 1950s. The one exception is from 1967, a time when a comparatively youthful peace movement was protesting the U.S.A.’s war in Vietnam. The hardcover book kicks off with a single-page comics introduction by artist Nate Powell of March acclaim. Next is a foreword by Noel Paul Stookey of Peter, Paul & Mary. Editor Yoe provides historical context to the reprinted comics in his “Peace Comics” essay. To me, context is an important element of such books. There is a history to the comics we do and it should be recorded. From a historical standpoint, I’m delighted this book starts with material from Ross Andru and Mike Esposito’s Never Again, a short-lived title that didn’t disguise its anti-war sentiments. The host of these stories was the Unknown Soldier and their settings ranged from the Roman Empire to World War II. One story worth noting is “No Common Ground” wherein refugees from outer space are surrounded by an impenetrable steel-like wall. The peaceful aliens have superior weaponry, but only want someplace to live in peace. It’s not looking good for either side until an alien child and a Earth child are found playing with each other. Though the basic plot to this tale was repeated over the years, this 1963 story penciled by Bill Molno and Rocco Mastroserio still brings a smile to my face. Not all of the stories in the collection have such happy endings. But the overall theme of the volume is that hope and peace are not beyond our ability to achieve. That is a important lesson for our own contentious times. 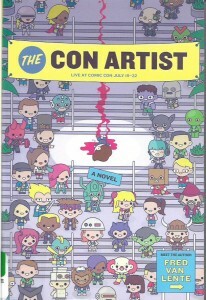 The Con Artist by Fred Van Lente [Quirk Book; $14.99] is a murder mystery set at Comic-Con International. The novel is a bit flawed, but I like it enough to recommend it to you. What sold me is protagonist Mike Mason, a comic book artist with a couple of very successful projects in his past, one of which became a hit movie. After his wife cheats on him with his editor, Mason becomes a nomad. He travels from convention to convention, cutting deals so that he can stay a few extra days after each convention. He has storage units in several cities. I love this concept a great deal and wouldn’t mind seeing another Mike Mason mystery. Mason is supposed to accept an award for an elderly artist, one of the best, who inspired Mike and who was ripped off by a publisher in so many ways. The artist dies just before the convention, which Mason doesn’t learn about until an odd young woman who says she’s assigned to assist him at the show, tells him about it. That’s sad, but it’s the most normal thing that happens to Mason. The editor who stole his wife is murdered. The cops think Mason was the killer. He’s pursued by thugs and has no idea why. His wife – they never signed divorce papers – shows up at the con. A popular writer is trying to lure him back to the title on which Mike made his bones. He’s kidnapped by the publisher who screwed his mentor. And so and so on, all interwoven with crazy comics and convention stories based on reality. Throw in excellent Tom Fowler drawings appearing throughout the novel and you’ve got an entertaining read. For the most part. Van Lente doesn’t nail the ending. The final chapters include many twists that make for a much-too-complicated conclusion. The novel needed to be either shorter or longer, the latter to make a little more sense out of the events. It’s a good book, but it doesn’t fill me with satisfaction. Just the same, I want to encourage you to give it a chance. I like the Mike Mason character and some of the supporting players. I want to see more of them. 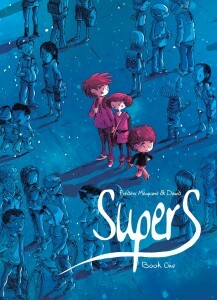 Supers: A Little Star Past Cassiopeia by Frédéric Maupomé with art by Dawid [Top Shelf; $14.99] is the first book in a graphic album series about three young refugees from outer space. Older brother Matt and siblings Lily and Benji were abandoned on Earth by their parents in an effort to protect the kids. They’ve found a place to live and made it seem their folks are around. They have enrolled in school. But school can be tough for the new kids, especially when they have powers they can never use in public. Matt, Lily and Benji live with the fear of being discovered and what would surely happen to them if they were. Supers won me over with its realistic portrayal of the “new kids in school” scenes and its never overpowering sci-fi elements. I like how the kids have each other’s backs and the desire to help people, even though their good intentions sometimes don’t work as they had hoped. The writing and art tell their story in an engaging manner. I’m in for the whole series. Pensacon 2019 in Pensacola, Florida is my next convention. It’ll be held February 22-24 at the Pensacola Bay Center, Pensacola Grand Hotel and other venues in the city. It’s one of my favorite events of the year and I hope to see some of my “Tony’s Tips” readers at the convention. You’ll have an amazing time!